The future holds so much promise, yet our advances—the ones that make our lives more easy and predictable—are the ones that will upend the advances’ promises of better. The advances of “smart” technologies will create entrenched changes in people that will defy treatment. Besides the effects from the smart technologies, the lessening of joyous movement by children and the withdrawal from nature will cement the entrenched changes further. Offering young children smartphones as playthings is the beginning of the entrenched changes. The children will be affected in the eyes, in the cardiovascular circulation, in the olfactory abilities, and in the processing of emotional thoughts. The addictive draw of the screen’s amazingness pulls from the children their natural rush to move, which will affect their spinal and muscular development. The wondrousness of the screens’ offerings will lessen the wondrousness of the natural world and the children will lose their connection to the Earth’s glory, which will affect their senses of taste, touch, and intuition. Adults who wear the smart gadgets will have less ingrained changes than the children, but if they also reduce their movement and distance from nature, then their bodies will respond unhappily. The changes depend on age, length of exposure, and time spent with other people. Distancing from nature and lessening of movement, when accompanied by the side effects of the latest generation of medications, will exacerbate the side effects. People who take these medications require continuous connection to nature and joyous movement to lessen the side effects. Here ends input from God about the impact of smart gadgets and medication side effects combined with sedentary lifestyle and little exposure to nature. This response relates to the blog posts EGC sessions with God: The health effects of the latest technologies, Reaction #1, and Reaction #2. I am sad to be the bearer of this information, but I do hope that people will heed these messages of warning. IN yesterday’s blog post, we were informed that the latest technologies are causing new types of illnesses. That knowledge is distressing, to say the least. I pushed for advice about dealing with the onslaught of external changes (like smartphones, smart watches, activity trackers, wearable computer glasses, and to-be-announced-soon footwear, that uses computer tracking). In today’s blog post, we will receive advice from God about protecting ourselves from the latest invasive technologies. I know these new devices seem helpful and are appealing, but we’re being warned about their future bad effects, and we really need to pay attention–me too! Tracking steps is confused desireability. Knowing exactly how far you’ve walked or how many steps you’ve actually taken seems desireable, but the devices that provide this information will cause illnesses and changes in body functioning. Don’t use these devices. Placement of the devices is very important. The farther away from the body, the better. Keep smartphones in a container [backpack, thick waist pack, purse, or messenger bag]. When holding a smartphone, hold it for short periods of time. For children, no more than twelve minutes and no more than three times a day (no more than 36 minutes); for ages 20 and up, no more than fifteen minutes and no more than four times a day (no more than sixty minutes). For extended viewing of the screen, place the smartphone in a holder and don’t hold the holder. A reminder from yesterday’s blog post: the younger the age of exposure to these devices, the more havoc created for the body. If you have young children, resist the pull to use these devices to pacify your children. Technology has enabled us to continuously harm ourselves by creating wearable invasive gadgets. Smartphones that are constantly in our hands and next to our ears, in our pockets near sensitive organs, and even in bras and undergarments. 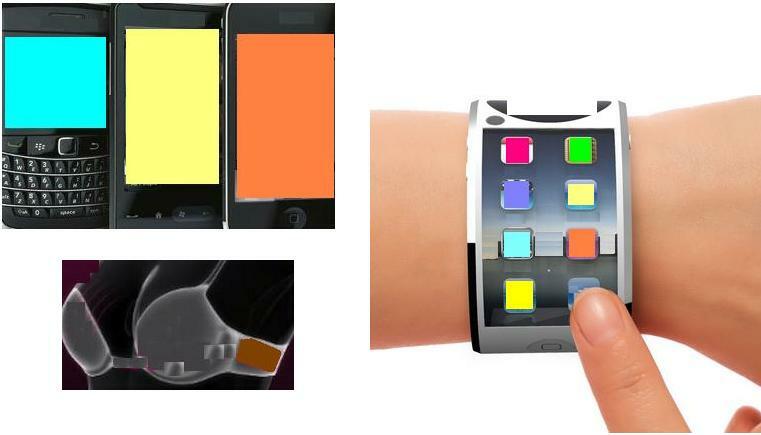 Smart watches that are constantly attached, near our bones and our pulse points. Smart glasses that sit near our brains! And more wearable invasive items are in development. These gadgets are seemingly helpful to us. In reality, they harm us in ways that are yet unknown. The harm depends on how long the invasive items are next to us and on our ability to battle the effects. The strategy for minimizing the damage is to keep the “smart” items as far away from our bodies as possible. The easiest way is to not buy the wearable items. As for smartphones, keeping them in away-from-the-body containers is best. Pockets are too close, much too close. As is holding them all the time. Using technology is fine when we use it wisely. Using technology wisely is the challenge.